“We have some doubt whether it would really prove useful.” The origins of UK opposition to a Global Tax Body. As OECD and G-77 countries debate the status of the UN tax committee at the Financing For Development conference in Addis Ababa, the finger has once again been pointed at the UK and US. The UK joined the US and several other wealthy countries at the UN financing for development conference in Addis Ababa in a manoeuvre to limit discussions on tax policy at the UN, arguing that the Organisation for Economic Cooperation and Development (OECD) was taking the lead on tax issues. The Observer has established that the UK is lobbying to remove paragraph 10 from the draft Doha Outcome Document…Paragraph 10 focuses on fighting tax evasion. It aims to encourage global tax information-sharing and simplified tax laws. 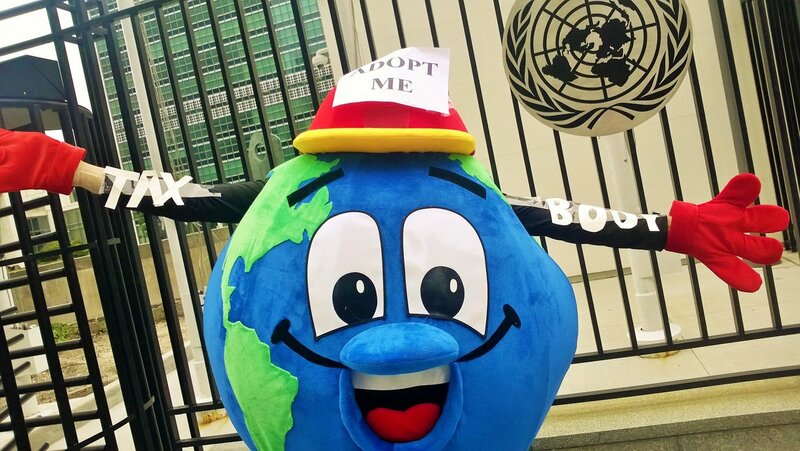 Most crucially, it wants to upgrade the UN’s tax-expert panel to intergovernmental status, elevating the importance of the issue of individual and corporate tax avoidance and evasion. The UK, together with the US, Canada and Australia, are opposed to the measure, according to sources in the UN. These positions are hardly new. As the memo reproduced below shows, the UK was opposed to the creation of the original ad hoc group of experts, which became the current UN committee, way back in 1967. The UK view then was that this “technical matter” was better discussed in a “more homogenous group” (the OECD), rather than risking “confrontation” between capital-exporting and capital-importing countries. The current OECD member state argument is mostly about the cost of a parallel bureaucracy at the UN (see, for example, this EU position statement [pdf]). While that was also present in 1967, it’s interesting that today the UK’s main concern, about confrontation at the UN, is no longer articulated by the UK. Link to the memo on Slideshare. A global tax body for what? To this end, we will increase the frequency of its meetings to two sessions per year, with a duration of four working days each. We will increase the engagement of the Committee with the Economic and Social Council (ECOSOC) through the Special Meeting on International Cooperation on Tax Matters with a view to enhancing intergovernmental consideration of tax issues. Over on his ever-insightful Uncounted blog, Alex Cobham points to three possible outcomes: the OECD retaining leadership, a shift towards the IMF, and the creation of the intergovernmental tax body that campaigners want. This builds on the analysis put together by Eurodad [pdf], summarised in a short post. What I intend to do here is to step back a little from the advocacy messages and think both concretely and theoretically about what that ‘stronger UN’ option really is. A significant moral weight. It is easier to justify a new law that might otherwise scare investors, or a tax treaty negotiating position, if it complies with international norms. Technical sophistication. For a developing country with a small bureaucracy, taking an ‘off the shelf’ set of transfer pricing rules is much easier than developing your own. In the area of information exchange, there is the Global Forum peer review process, which relies on the threat of counter-measures, and there is the Multilateral Convention on Mutual Assistance, which is binding, but far from universal. The overall purpose of the intergovernmental UN tax body should be to ensure that countries do not erode each other’s tax bases, and that the international tax system is transparent, coherent and supports equality and development. In order to do this, the body would have to address a number of different issues, including base erosion and profit shifting, tax and investment treaties, tax incentives, progressive taxation, taxation of extractive industries, harmful tax practices, beneficial ownership transparency, public country by country reporting, automatic exchange of information for tax purposes and alternatives to the arm’s length principle. In order to ensure that the mandate of the tax body is broad enough to tackle all these issues – as well as new issues that might emerge – it’s important that the mandate is not too narrow and specific. In international relations thinking, there are broadly three themes that different scholars use to analyse what international institutions are and what function they serve. They boil down to power, preferences and ideas. From this perspective, international institutions are merely tools through which dominant states exert their power. This would lead us to conclude that any realignment in the politics of international tax will (or will not) happen regardless of what goes on at the UN next week. An upgraded UN committee wouldn’t create change, rather it would simply reflect a shift in the underlying power dynamics. The annex to the UN transfer pricing manual, and the participation of developing countries in the BEPS project, already illustrate this. The way to get better outcomes for developing countries would be to bolster their capabilities, rather than to realign institutions, which would play no causative role in itself. A second way of looking at things is to put power to one side and think about collective action problems. In this view, states create institutions because they need some kind of coordination mechanism to help overcome the natural incentives that make cooperation difficult. Cooperation to deal with double taxation is described by game theorists as a coordination game (also known as a ‘battle of the sexes‘ or ‘Bach or Stravinsky’): everyone wants to reach an agreement, the difficulty is just finding a ‘focal point’ around which to converge. The model treaties are focal points that represent the widest possible agreement at international level, but leave the hard bargaining on non-consensual issues to the bilateral setting. If this is the case, international tax institutions’ most important roles are entrepreneurship and signalling. They create focal points around equilibrium solutions from which everyone will benefit. Critics of the current regime argue that even when using the UN model treaty, the resulting treaties benefit capital exporters more than developing countries, who have to make most of the sacrifices of taxing rights. They want to see a more radical (or stripped down) UN model. But if the role of the UN model is to signal an equilibrium point, making it more radical might mean that it ceases to play this important role, because in fact it doesn’t represent a possible equilibrium between different groups of countries any more. This might come at the same time as the OECD instruments cease to play that role because developing countries are also beginning to deviate from them. The goal here would be to find a new equilibrium, from which developing countries benefit more, but on which everyone (or enough countries) can still agree. The third lens we can use begins from a fundamentally different point of view: that the international context can change the preferences of diplomats, and hence of countries themselves. Perhaps the most important outcome of the inter-war years was to begin to create a community of international tax specialists…a community within which ideas and perspectives as well as economic advantage could be traded. It was these direct contacts between specialists which filled the gap created by the difficulties of resolving by any general principles the issues of international allocation of the tax base of international business. Our view, which is shared by the Americans and the Dutch, has been that it is of little use to try to “educate” developing countries – at the United Nations Expert Group on tax treaties and elsewhere – about acceptable international fiscal standards if, when it comes to the crunch, we are prepared to sacrifice principle in order to secure an agreement. Mr Cropper [from Kenya] said that Kenya’s proposal was only intended to close a loophole and he did not see why there should be any objection to it. It was a point which had been raised by a number of countries in the UN Group of Experts…Mr Cropper said that there had been a big change in developing countries’ attitudes in the UN Group of Experts…Mr Ihiga [also from Kenya] said that modern thinking was that a withholding tax on management fees was justified. If ideas are important, the UN should be seen as a community of experts working not just to find solutions that fit the power balance and national preferences of UN member countries, but rather to change international norms and national preferences, towards a more pro-development orientation. How could a restructured UN Tax Committee achieve that? ‘Upgrading’ advocates generally name three categories of reform. Let’s consider each in turn, in the light of the above discussion. While it would have some effect on the UNTC’s prestige, funding and composition, the major change that this would create would be to politicise the UN committee. It would mean that national members were more accountable to their home governments and to civil society. Like other issues such as trade and climate change, the shifting balance of power between developed and developing countries would probably increase the areas in which there was a stalemate. Politicisation would also allow campaigners in developed and developing countries alike to work at that national level to act as allies of radically positioned developing country officials, potentially increasing their negotiating capabilities, but crucially also changing preferences at national level. A second impact would be that it would allow countries to send the most relevant person for a given discussion, and so the UN committee could expand its work onto a wider variety of issues. I don’t believe that it would deliver an international convention that would bind developed countries and tax havens into new rules any time soon, because the power relations are not yet aligned in that way, and because it’s hard to see a solution around which national preferences are aligned. With more members from developing countries, we might expect that majority opinions that suit developing countries could be forced through the committee more easily. Or, more practically, developing countries might be able to make their case more forcefully in deliberations. But if the aim is to find an equilibrium point that will work in the real world, simply outnumbering developed countries to produce a more radical set of UN instruments without changing the preferences of developed countries will be of limited effect. This is why “tyranny of the majority” is currently a last resort when the committee takes decisions. This would create a more autonomous secretariat that might be able to compensate for developing countries’ more limited technical capacity in UN discussions, doing some of the work to assuage objections from developed countries and so find more developing country-friendly focal points. It would also make the secretariat more visible, enhancing the prestige of UN instruments, just as senior OECD secretariat staff travel the world promoting its instruments. More funding for more frequent meetings might allow the committee to work faster, keeping up with changes at the OECD, but this would depend in part on developing countries’ capacity to participate. In conclusion, the development case for a better-resourced, more transparent UN committee is compelling. But the committee’s impact will continue to depend on the uptake of its instruments by countries in national laws, bilateral treaties, and adherence to any new binding multilateral convention. For this reason, ideas and preferences in developed and developing countries will need to change, alongside developing countries becoming more capable actors in international negotiations. A more dynamic, politicised UN committee might help to create those things over time, but in the meantime I think it is just as much at the national level that campaigners need to focus their attention if they want to change international outcomes. UN tax committee meets this week: but what is the UN model for? It tells countries what works technically. It combines the wisdom of some of the most experienced tax officials in the world to produce a technically sophisticated template that negotiators can rely on. It tells countries what is politically palatable. If a provision is included in the UN model, for example, a group of experts from developed and developing countries have all been willing to agree to its inclusion, so neither side is going to consider it too outrageous. It tells countries what is acceptable behaviour. The models sketch out the concepts and principles that committee members think should underpin a country’s international tax system. It conveys an expectation that a country’s tax rules should be compatible with these concepts and principles. From an international relations side, we might say that the first two purposes are about reducing transaction costs for negotiations, by providing countries with information ahead of time. The last one, on the other hand, would suggest that treaties act as instruments through which norms about acceptable behaviour are established and diffused within an international community. When the 2010 update to the UN model treaty was being finalised, there was some controversy around article 9, which deals with transfer pricing and the arm’s length principle. The commentary to the previous version of the UN model stated that the OECD’s transfer pricing guidelines were “internationally accepted guidelines” and recommended that countries should follow them. A minority of committee members didn’t accept this view, and so rather than resolve the conflict, the commentary now records that [pdf] “The views expressed by the former Group of Experts have not yet been considered fully by the Committee of Experts, as indicated in the Records of its annual sessions.” Unusually, the record of the discussion identifies the dissenters as the Chinese, Brazilian and Indian members of the committee. It is worth noting that none of these three individuals are still members of the committee. the Committee has developed the United Nations Practical Manual on Transfer Pricing for Developing Countries which pays special attention to the experience of developing countries, reflects the realities for such countries, at their relevant stages of capacity development, and seeks broad consistency with the guidance provided by the OECD Transfer Pricing Guidelines. It seems inconsistent for G20 countries and other non-OECD countries that are now advocating for their views to be reflected in the OECD Transfer Pricing Guidelines to accept concessions from others participating in the development of those Guidelines and then undercut the very outcome of those negotiations by arguing elsewhere for positions that were rejected in that forum. If any notion of “fairness” has relevance in international tax, surely it should include the concept that acceptance of an invitation to bargain on an equal footing over a set of rules carries with it the good faith obligation to live by those same rules. This might be an argument based on purpose 1, 2 or 3 above. On 1, USCIB is arguing that the changes will create technical problems. On 2, it is arguing that the political signalling effects of the OECD and UN models undermine each other when countries agree to one thing at the OECD and push a different position at the UN. Finally, on 3, it is clearly concerned about diluting the clear message sent by the treaty commentaries at present, which is that the OECD guidelines are the only internationally accepted authority when it comes to transfer pricing. Both as a discussion in its own right [pdf], and through a paper for the Extractive Industries subcommittee [pdf], there’s a lot of discussion of “indirect transfers”, where a capital asset in a developing country is sold, but the transaction takes place through the sale of a holding company located in another country. I have written about an example of this recently, and it was highlighted in the recent IMF spillovers report. As I observed, it doesn’t look like the G-20/OECD processes are going to look at this problem in any depth, so this is an instance where the UN committee is examining an issue of clear concern and interest among developing countries. The discussion focuses on article 13(4) which covers the sale of a company whose value consists principally of immovable property. This may include a mine, or a capital-intensive business such as a mobile phone network. The UN papers highlight a range of administrative issues: how a developing country can know if a sale taking place abroad falls within the scope of this article, how to value the gain, how to define “immovable property” since the model treaties are not as clear as they could be on this matter. While both the UN and OECD Models now contain optional Assistance in the Collection of Tax Debt Articles for countries wanting to provide for this in bilateral tax treaties, and there is a multilateral OECD/ Council of Europe Convention on Mutual Administrative Assistance in Tax Matters on the subject, this is not yet something most developing countries have provision for in their bilateral or multilateral relationships. This is something tax authority officials from developing countries are definitely seeking from renegotiations. In the meantime, the extractives paper describes alternatives, which include asking the purchaser (who by definition will have assets in the country) to withhold the capital gains tax when paying for the transaction, and refusing to grant export licenses until the capital gains tax has been collected. I don’t know how controversial this is going to be, but insofar as it is about providing advice to developing countries, I think that makes it a matter of purpose 1. The committee is going to discuss a draft article [pdf] that would allow developing countries to tax technical services. This is a provision that exists in some form in many tax treaties already, and has been introduced into models such as the East African Community’s new model treaty. But neither the UN nor OECD model treaties include it. From a technical point of view (purpose 1), this new addition should be a good thing: since these provisions are fairly popular among developing countries’ tax treaties already, having an international Committee of Experts formulate a model provision built on their collective wisdom is surely a good thing. Given that it is the unanimous view of OECD Member States that the source basis taxation is not appropriate for services performed by a nonresident outside that State, it is unlikely that the country where services are performed will give up its right to tax and therefore such a provision is unlikely to serve as an effective model for bilateral agreements. While the UN Model reflects different interests than the OECD Model and different rules are therefore appropriate in some cases, it should be considered if deviating from a rule in the OECD Model that reflects unanimous agreement among OECD member countries will inevitably lead to conflicts in treaty negotiations. Doing so will likely encourage countries to take aggressive unilateral positions (in the absence of a treaty). The adoption of this rule on a unilateral basis will increase double taxation, reduce cross-border trade and increase costs for local consumers. This is an argument that really goes to the heart of what the UN model is for. I think the ICC’s concern is that including an article sanctioning withholding taxes on technical fees in the model treaty will embolden developing countries to insist on the right to levy such taxes, and that this will make it harder for them to reach agreement with developed countries. That’s purpose 3. An opposite argument, of course, would be that the UN committee, with members from OECD and non-OECD countries, should be in a good position to formulate an article that reconciles the concerns of OECD members and non-members. That’s purpose 2. Following the ICC’s argument cited above, the model treaty’s job is not to provide a template that is to be used where countries do agree to include a particular provision. It is about circumscribing a definition of what is considered reasonable behaviour by a developing country. Keep it out of the model, they are saying, to discourage developing countries from doing it altogether. What is the UN tax committee for, anyway? In January, the UN tax committee sent out a call for submissions [pdf] to the update of its transfer pricing manual. The subgroup working on this update will be drafting additional chapters on intra-group services, management fees and intangibles, all topics that greatly interest developing countries and civil society organisations grouped around initiatives such as the BEPS monitoring group. So who made submissions to the UN consultation? Four private sector organisations, two academics, the World Bank and the Chinese government. Not a single NGO. Meanwhile, considerable effort has been expended by civil society groups in drafting submissions to and reports about the OECD’s BEPS process, lamenting how issues of concern to developing countries are likely to be left by the wayside. I think this is a pretty strange prioritisation. Why focus all your energies on a process that you suspect is not going to deliver results for developing countries, and ignore entirely a process with a specific mandate to do so? I debated this a bit on twitter earlier this week with, among others Alex Cobham of the Centre for Global Development, who told me he considered it “self-evident that BEPS is relevant to developing countries’ tax base in a way that UN Transfer Pricing Manual may not be.” (We were also discussing automatic information exchange, which I’ve discussed before). @martinhearson Afraid I think self-evident that AEoI & BEPS processes relevant to dev info/tax base in a way that UN TP Manual may not be. In the short-to-medium term it’s important to take into account both the size of what is at stake and the capacity of civil society groups to influence it. But there’s a long term dynamic too that means it may be strategic (unstrategic) to work on something that is unlikely (likely) to succeed in itself but will contribute towards (undermine) a long term strategy. I’m going to try to explain why I think this calculation is wrong. 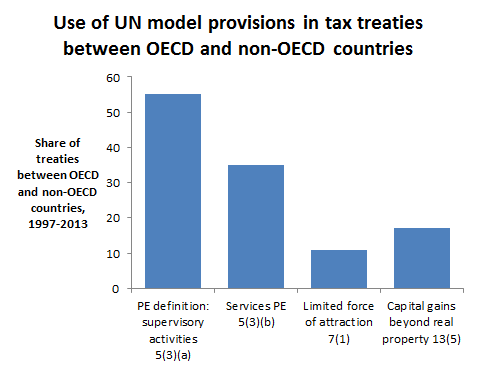 Both the OECD and the UN are soft law bodies when it comes to tax treaties and transfer pricing. They set standards in the form of model treaties and guidelines, but these have no binding effect on countries unless they choose to use them in treaty negotiations and in their domestic transfer pricing rules. This applies to the outcomes of OECD deliberations just as much to those of the UN. (Nothwithstanding the OECD’s proposal for a mutlilateral convention to implement the treaty aspects of BEPS, which will presumably be offered as a fait accompli to developing countries, including negative as well as positive aspects for them). To influence the distribution of the international tax base, then, you need to influence bilateral treaty negotiations and national lawmaking. When it comes to treaty negotiations, at the level of standard-setting you can do two things: influence the developed country position (the OECD model) and influence the developing country position (the UN and regional models). The former will be harder, but will it have a bigger potential impact than the latter? As I mentioned in my post a couple of weeks ago, a recent IBFD study shows that, where the model treaties diverge, the OECD model seems to be used more often than the UN model, which seems like a logical outcome of differentials in negotiating strength. So before even looking at how the model treaties might be changed, the best outcome for developing countries is surely to increase the prevalence of UN model provisions in negotiated treaties. In any event, the UN model is by no means ignored. Some of its most distinctive provisions, such as the services permanent establishment and source state taxation of royalties, have been adopted quite widely.. Turning to transfer pricing, you might remember that the first edition of the transfer pricing manual created some waves. This was mainly because of its inclusion of a annex on the ‘country practices’ of China, Brazil, India and South Africa, which emphasised their points of dissatisfaction with the OECD’s predominant transfer pricing guidelines. It is perhaps too early to see how influential the UN manual will be. Accept for a moment the view, propounded by NGOs and sketched out in Chapter 10 of the UN manual, that OECD transfer pricing rules deprive developing countries of tax revenue because of enforcement troubles and an inherent bias towards countries that can capture the intangibles and high-value services. In that case an official document written by government officials discussing these issues and articulating alternatives is clearly very useful. Some people have suggested to me that the authors of Chapter 10 might be using it mainly as a tool to influence the OECD, but on the other hand there’s definite interest in its content from developing countries. South Africa indicates in its contribution that it is considering some aspects of the Indian and Chinese approaches. I realised last October that although OECD members are in a minority on the UN committee, once you include the G20 members who are full partners in the BEPS process, the figure rises to 16 out of 25. And many of the individuals in key positions on the UN committee are the same people who represent their countries in the relevant OECD committees. So it would appear that for the UN to articulate any kind of alternative to the OECD, some of these people would need to set aside narrow national interest. Cynics feel that this is unlikely. And yet the UN is doing alright. In the face of stiff opposition from a number of developed countries and the private sector, it’s ploughing ahead with a new article in its model treaty giving source countries the right to tax technical service fees. Developing countries often want such an article included when they negotiate, and they’re more likely to get it if it’s in the UN model. I noted above that the UN’s transfer pricing manual is quite critical of the OECD approach, if only in its annex. Early plans for the manual proper had included greater divergence from the OECD approach, including discussion of fixed margins and formulary apportionment. During the drafting process these points were largely eliminated or relegated to the aforementioned annex. If NGOs feel let down by what they see as the timidity of the UN committee, they might do well to study how their own (lack of) engagement in processes like this contributes to the outcomes in which they express disappointment. Having sat in on several sessions of the committee, I’m in no doubt that when matters like this come up for debate they stand or fall on the strength of feeling among the committee’s members, who in turn listen to the views of lobby groups. Business groups certainly think so, as evidenced by their submissions to the transfer pricing manual consultation. If UN committee members were being lobbied at committee meetings, held to account in their home countries, and barraged with written submissions, all on the basis of a coordinated and specific agenda such as NGOs have developed for BEPS, the outcomes really would be different. That more confident exploration of unorthodox approaches proposed for the UN transfer pricing manual, for example, might well have made it into the final draft. I have less to say about this, because my experience of the UN is limited to the tax committee we have today. Most international relations theories accord power to international organisations in their own right, not just the sum of their members. An organisation’s power might come from its technical dominance, by exerting social pressure as monitoring reports from the OECD and IMF do, and through agenda setting, which is also a power that NGOs have. How much attention NGOs show towards an international organisation most certainly affects that organisation’s capacity to set the agenda, and its authority to speak about developing country issues. It’s only one part of a bigger picture, of course, but nonetheless, development NGOs’ propensity to engage in media battles with Pascal Saint-Amans, and to attend OECD meetings in force, even if making critical comments, reinforces the idea that the OECD is where the action is for developing countries too. Of course the OECD can make technical reforms that help developing countries, but, since international tax is also about political settlements, I think it’s a strategic error to focus the overwhelming share of NGOs’ resources there at the expense of the UN. Oxfam goes for the full Tanzi…but is that far enough? I spent the weekend with some old friends from the development sector. One of them, it now turns out, is working for a public relations consultancy. There was an awkward moment when I explained that I was working on international tax and my friend asked, with a sheepish grin, whether I was following BEPS. We were both following it from, well, different angles. The most interesting moment in our conversation came when my friend mentioned clients’ fear of the ‘Margaret Hodge effect’. I can understand that, I thought. No company wants to see its executives thrown to the wolves in the Public Accounts Committee. But I had misunderstood. “What my clients are concerned about,” said my friend, “is political interference in corporate tax policymaking.” I found this quite startling. Is it possible that businesses consider corporate tax policy to be a matter for private negotiations between them and the government, rather than the subject of public (and even parliamentary) debate as part of the government’s budgeting process? The UK’s corporate tax regime has been dramatically overhauled over the last ten years, with a plummeting corporation tax rate and vast swathes of the multinational tax base exempted. This is a serious structural change in our tax system, yet there’s been barely a peep about it in public debate. And we continue to sign tax treaties, with only a cursory discussion in parliament each time. The public attention is only ever caught by the ex post impact of policy decisions in the tax returns of multinational firms. Hence why Pfizer’s bid for Astrazenica, and not the policy reforms that encouraged it, has been front page news. Firstly, the business lobby currently has a disproportionate influence on the process, which it uses to protect its interests. Correcting the rules that allow the tax dodging practices of global giants like Google, Starbucks and others that lead to tax revenue losses in OECD countries will be difficult, given the size of the corporate lobby. But worse, perhaps, is that the interests of non-OECD/G20 countries are not represented at all in these negotiations. Working towards a World Tax Authority to improve governance of international tax, along the lines proposed many years ago by Victor Tanzi. This is all important stuff, but it’s missing something: a strategy to increase political engagement with corporate tax policymaking. International institutions can shape countries’ preferences and strategies, but the decisions they take (and maybe even the ways they work) are still products of the different positions taken by their member states. National politics matters. If, as Oxfam argues, the business lobby has a disproportionate influence at the OECD, that influence won’t only be exerted at international level: it must also be applied inside the member states, who ultimately make the decisions at the OECD council. Is it wise to open up the source/residence debate within the BEPS process, as Oxfam proposes, when businesses favour reduced source state taxation? There is certainly a case for re-examining the political settlement at the heart of international tax institutions, but the outcome of such a process will surely follow the distribution of power among its participants. If, as Oxfam also argues, developing countries are not participating in the decisionmaking, that isn’t just because the space for them is limited. It is also because they aren’t making the most of the opportunities available to them. Many of the UN tax committee’s most developing country-friendly initiatives in recent years have been led not by its developing country members but by members from OECD countries putting themselves in developing countries’ shoes, or by members from emerging economies whose interests do not always coincide with developing countries. That’s fine so long as international tax is a technical exercise, but an inclusive political process would cast these conflicts of interest in sharp relief. Developing countries’ failure to take advantage of the opportunities that are already available to them can be seen in the tax treaties they have negotiated, comprehensively studied in an IBFD report for the UN tax committee [pdf]. Many significant clauses from the UN model treaty, which would confer on developing countries greater taxing rights, are absent from most of the tax treaties signed by developing countries. There are some examples in the chart below. I don’t know (yet) why developing countries often get such poor outcomes, but what happens in bilateral negotiations would surely occur in international negotiations too. Duncan Green situates the BEPS process in the later stages of the “Policy Funnel” (below), when “the technical content gets greater, and the chance to mobilize the public declines.” But corporate tax policy has been at that end of the funnel since the 1920s. The aim should be to drag it back towards a public debate. What Oxfam is proposing would lead to an even larger technocratic tax community at international and national levels (a world tax organisation, and more tax authority capacity in developing countries). That may well be necessary. But what we need even more is for politicans and the public in each country to hold the technocrats to account. It seems to me that this can be done more effectively by beginning at the national level, looking at domestic tax rates, tax incentives, and tax treaties. Until that happens, I don’t think that the politicians of developing countries will pay enough attention to BEPS or anything of its ilk to get stuck into the politics and shift the centre of gravity of international corporate tax policy.